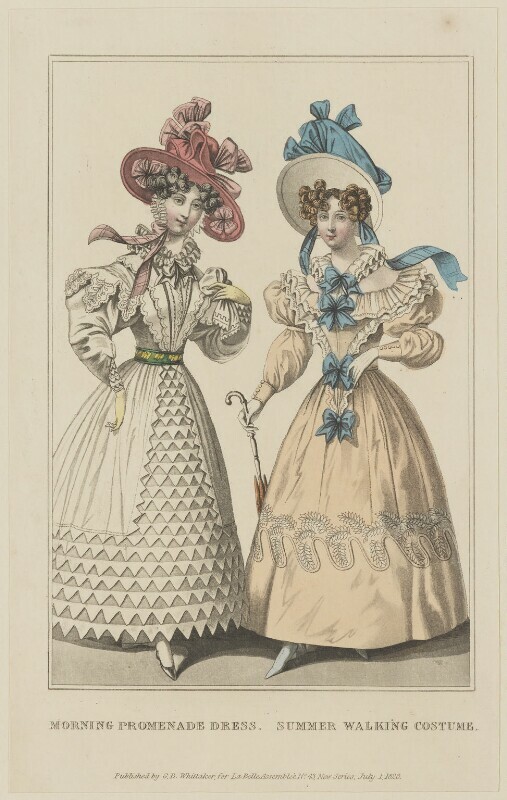 La Belle Assemblée or Bell’s Court and Fashionable Magazine (1806-1832), Magazine. Artist associated with 57 portraits. William Read (active 1824-1837), Engraver. Artist associated with 30 portraits. George Byrom Whittaker (1793-1847), Publisher and bookseller. Artist associated with 26 portraits. Summer Walking Costume. A dress of embroidered muslin, of a light saffron-colour, bordered with a broad bias fold, headed in languette scalops, edged with a narrow rouleau-binding of satin, the colour of the dress: above this are branches of fern beautifully worked in white raised embroidery. The sleeves are à la Marie, and are confined only in the middle of the upper part of the arm above the elbow, by a band, the same as the dress; and at the wrists by a very broad cuff of satin, with five buttons on the outside of the arm. A pelerine is worn with this dress, of fine clear muslin, trimmed with the same, with a delicate, light embroidery of hortensia-colour, just above the hem. This pelerine is of the fichu shape, the ends brought together in a point in front, and fastened all the way down at equal distances, by rosettes of etherial-blue ribbon. A small double frill surmounts the pelerine at the throat. The hat is of white chip, trimmed with etherial-blue sarcenet, and ribbon of the same colour, with strings floating. Pearl-grey half-boots of corded gros de Naples complete the dress. Morning Promenade Dress. A tunique-pelisse-robe of white jaconot-muslin; the front and border ornamented with vandyke points of the same material, doubled; the vandykes pointing downwards; round the border are seven rows of these ornaments, and up the front of the skirt, in the Bavarian style, which, together with the border, form the tunic, rows of points are placed above each other, yet without falling over, so as for the upper row to touch that beneath. The sleeves are en gigot, with mancherons in pointed scalops, of fine Honiton lace; and a pointed cuff finishes the sleeve at the wrist, ornamented with vandykes, to suit the trimming on the robe. The body is made with double fichu-lapels in front of the bust, edged with narrow lace, and surmounted at the throat by a double ruff of lace. A bonnet of rose-coloured gros de Naples is trimmed with the same coloured ribbon, chequered with green, and a slight ornament of sarcenet of the same hue, en fers de cheval. A rosette of ribbon is placed under the brim over each temple, of the same kind as the bows and strings, which latter float loose. The hat ties under the chin with a mentonnière of quilled blond.